At the start of the new millennium, the Lord Jim Lodge had more or less dissolved, even though it formally continued to exist and came to life again for a moment at sporadic meetings. However, it never played a major role in the work of the three remaining Lodge founders. 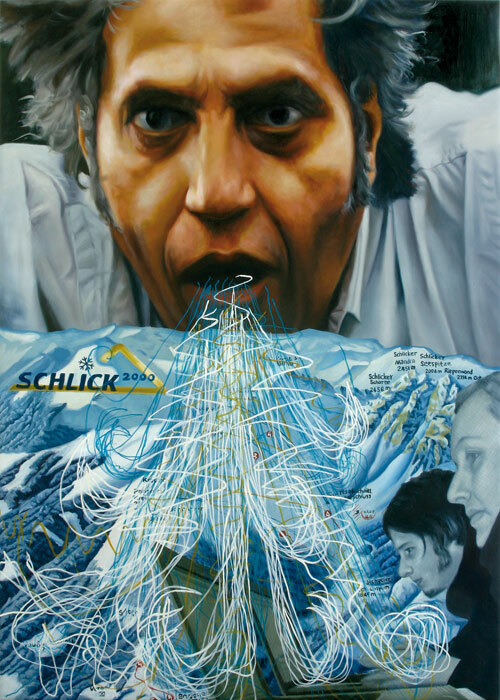 Oehlen participated in the “Expo 2000”, Wolfgang Bauer went on writing the same old texts, and alongside his art activities Jörg Schlick also was teaching at the university known as the Fachhochschule Joanneum in Graz. Among his students were Daniel Fabry and Anika Kronberger, who for some time have headed the Graz branch of the Viennese group monochrom. With time, a friendship developed, and thus Jörg Schlick became acquainted with the work of monochrom, who, for example, had to represent Austria at the 2002 Saõ Paolo Biennial – with an extraordinarily elaborate and completely silly installation, by the way (see www.monochrom.at/thomann). Schlick and monochrom hatched plans for future projects and other forms of cooperation, but for the time being were never able to realize them. In 2005 Wolfgang Bauer died. The obituaries were profuse and also noted the author’s involvement in a men-only secret society.